We’ve made several trips to see Charlie (Shao Tiancheng) as he is currently staying at a foster home in Beijing. In November, we got to help him celebrate his birthday with cake for everyone and an iPad as his special gift. Some of our staff who could not make the trip to Beijing recorded video greetings for his birthday on the iPad and that brought him a lot of joy. 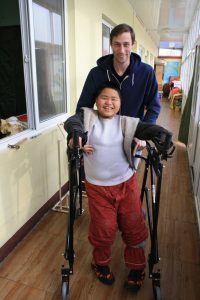 Most recently we took a standing walker to Charlie, as well as adaptive dressing equipment, which were both donated by one of his sponsors. His wheelchair is starting to break in places, so we are actively looking for a new one for him. Charlie continues to be a sweet, happy, and intelligent boy, and we are hoping his Forever Family will discover him very soon. His current foster home mostly takes care of children three years of age and younger, so Charlie is definitely the big brother of the home! During our various visits we have also trained the caregivers on how to engage the younger children in strengthening and balance activities as well as developmental play.